When a giant wave destroys his entire Nation - his family and everyone he has ever known - Mau finds himself totally alone. Until he meets Daphne, daughter of a colonial Governor and the sole survivor from a shipwreck. They have no common language, no common culture - but together they discover some remarkable things - like how to milk a pig and why spitting in beer is a good idea - and must try and forge a new kind of Nation. Then other survivors arrive to take refuge on the island, and not all of them are friendly. 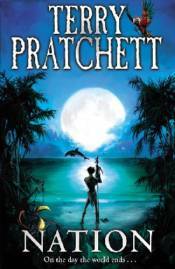 In "Nation", Pratchett brings us a novel that is both witty and wise, encompassing themes of death and nationhood, while also being extremely funny.